The ice on the Hudson River has finally melted so it’s time to dust off the cobwebs, roll back the boat covers, grab your foulies, and get your feet wet at the 2015 Tappan Zee Challenge Regatta. For the 16th consecutive year, Sonar Fleet 23 of Nyack Boat Club (NBC) in Nyack, New York starts the spring racing season with the Tappan Zee Challenge. This year’s regatta will be held on Saturday and Sunday, May 16 & 17, 2015. The Sonar, a 23-foot keelboat, was designed by Bruce Kirby in 1979 when his home club, Noroton Yacht Club in Darien, CT was looking for a way to get more members interested in club racing. Kirby obliged by designing a boat with a high performance, yet simple and efficient rig. The Sonar is a strictly one-design boat; it’s a challenge to tune and sail well, but easy to handle for sailors of all ages, strengths and skill levels. Providing possibly the best of both sailing worlds (racing and recreational sailing), the Sonar is fast through the water and also a good daysailer with its spacious and comfortable cockpit. A safe and well-behaved training boat to help teach new sailors, the Sonar has been greeted with enthusiasm by individuals and clubs worldwide and indeed was even inducted into the American Sailboat Hall of Fame in 2004. This year marks the 10th anniversary of the Adaptive Sailing Program at NBC. Jan has worked closely with the hospital to organize a full-day clinic for the participants the day before the TZ Challenge, as well as the opportunity for participants to observe the racing up close and personal from various club members’ spectator boats. Approximately 20 to 30 individuals sign up each year. 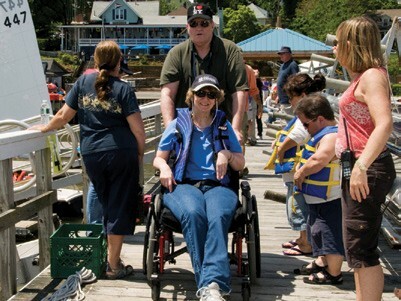 For someone who has experienced an illness or injury, and may be dealing with limited mobility or wheelchair use, getting out on the river is at once an exhilarating and peaceful endeavor. Many participants report that they never thought they would be able to do anything remotely like it. 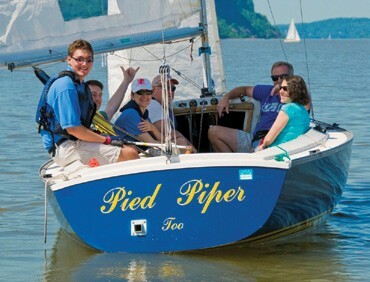 Other participants had sailed prior to being injured and are thrilled to be able to get back on a sailboat. For last year’s TZ Challenge, the first day dawned bright and clear and 12 Sonars sailed out to the racecourse. The wind gods were not cooperative and the competitors saw light wind out of every possible direction; occasionally seemingly out of two different directions at the same time! Sunday was the quintessential early spring day – bright sun, a warm breeze, and strong air. The RC started the day off with a triangle/windward/leeward course. It was an interesting and enjoyable change of pace. Continually in hot pursuit, second place finisher Rick Doerr, who sailed with Dave Franzel, Charles McClure and Kyrre Culver, finished only three points behind the leader. Keeping the pressure on those two teams were Bahar Gidwani and Sam Waterson. Sailing with Tom Speyer, Roman Hascoet, Chris Vargas and Eva Burpee, Bahar took third place over Sam in a tie-breaker. 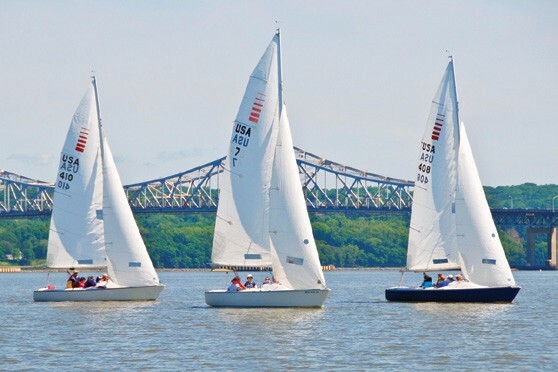 The TZ Challenge Regatta is open to all competitors meeting the Sonar Class Association eligibility, and Sonar Fleet 23 welcomes races from around the region to take on the Hudson’s challenging winds and currents at this early spring event. What better way to tune up for the Sonar Atlantic Coast Championships, to be held at the Sonar’s home at Noroton Yacht Club in mid-June? The Notice of Race is posted at www.NyackBoatClub.org/fleets/sonar-fleet-23. Amy Villalba lives in Mamaroneck, NY and sails with Lightning Fleet 75 at Nyack Boat Club.